Home » Events » On The Nature Of Things. Lviv Still Life Of The 1960s-80s. On The Nature Of Things. Lviv Still Life Of The 1960s-80s. On The Nature Of Things. Lviv Still Life Of The 1960s-80s curatorial project by Ostap Lozynsky. For the first century BC Roman poet Lucretius the poem De Rerum Natura (On the Nature of Things) was an opportunity, or even a need, to express his own philosophical views on the structure of the universe, the existence of people and things in it, the concepts of motion and peace, particles and the whole, life and death. Rereading of his vivid poetic visions unexpectedly leads us to personal reflection on serious things. “Things” indeed. 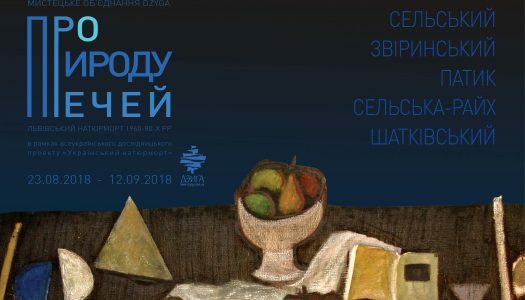 On August 23, 2018, in the gallery Dzyga as a part of an all-Ukrainian Research Project “Ukrainian Still Life”, an exhibition of works of Lviv artists from private collections “On the Nature of Things. Lviv Still Life of the 1960s-80s” opens. There will be shown ordinary things that are pictorially placed within the plane space (Lucretius would probably have named it as “emptiness”) of painting by very important Lviv artists of the twentieth century: dishes and flowers on the background of the young Carpathian Mountains by Roman Selsky, the teacher of freedom in art though the time of socialist realism; a medieval manuscript, a crucifix and a skull by Volodymyr Patyk, master of a picturesque visions, so attentive to the stories and impressions he experienced; meditative trifles by Karlo Zvirynsky, the spiritual guru of Ukrainian painting art; vibrating trembling of inanimate objects by Oleksa Shatkivsky, the sensitive artist of nature; window to the European world by Margit Selska, often called the “Queen of Painting”. What is the philosophy, the history, the “nature” hiding behind their still presence?..